© Robert Rauschenberg/ Licensed by VAGA, New York, New York. Photograph by R. H. Hensleigh. Robert Rauschenberg combines discarded objects and mass media imagery in works that blur the boundaries between art and everyday life. Beginning in the 1950s, he eschewed the introspective approach of Abstract Expressionism in favor of cultural exploration, finding the material for his art on the streets surrounding his New York studio. By juxtaposing photographs, newspaper clippings and assorted urban detritus, Rauschenberg reflected the diverse social and economic fabric of postwar America. His revolutionary Combines and photographic montages prefigured the tactics of 1960s Pop artists. 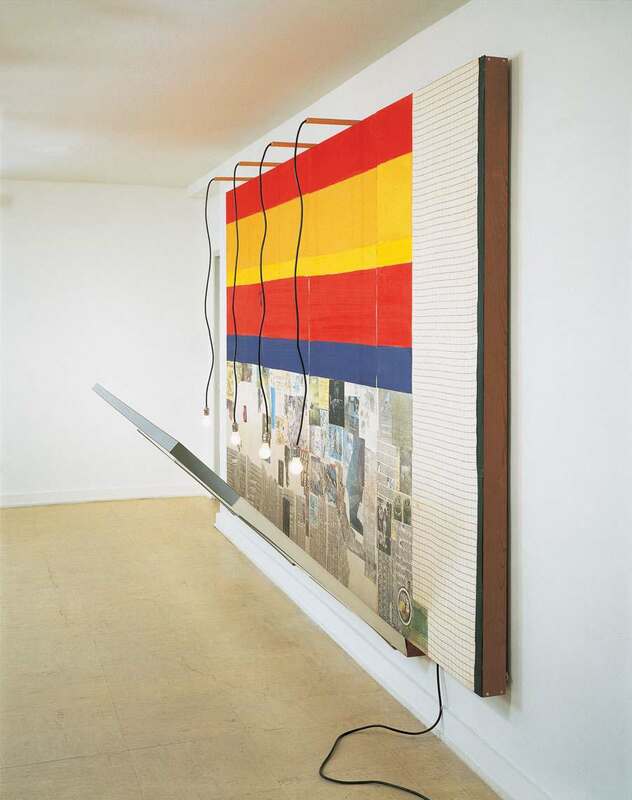 Ever the innovator, Rauschenberg also helped develop new printmaking techniques and, in collaboration with composers, choreographers and scientists, pioneered seminal forms of performance, installation and electronic art. Moon Burn is from the artist’s mixed-media Scale series executed from 1977 through 1981. Incorporating found materials and photographic transfers, it summarizes the diverse processes and themes that have engaged Rauschenberg throughout his career. The random images of nature, technology, art and commerce evoke the complexity of twentieth-century experience, a condition doubly reflected in a hanging mirrored panel with a row of dangling lights emphatically illuminating its multi-layered messages.